Prepare a large baking sheet with parchment paper. Place the spiralized squash noodles on the parchment and drizzle with 1 tablespoon olive oil. Gently toss to coat with the oil. Bake for approximately 10 minutes. Noodles should be al dente like pasta. While noodles are cooking, put 1 tablespoon oil into a skillet over medium high heat. Add the pork sausage, fennel, and garlic. Use a wooden spoon to break up the sausage as it browns. Melt the butter in a large skillet over medium heat, stirring constantly. Within 1-2 minutes the butter will begin to brown. Add the sage leaves and carefully swirl it around the pan until they become fragrant and darken a bit. Remove from heat. 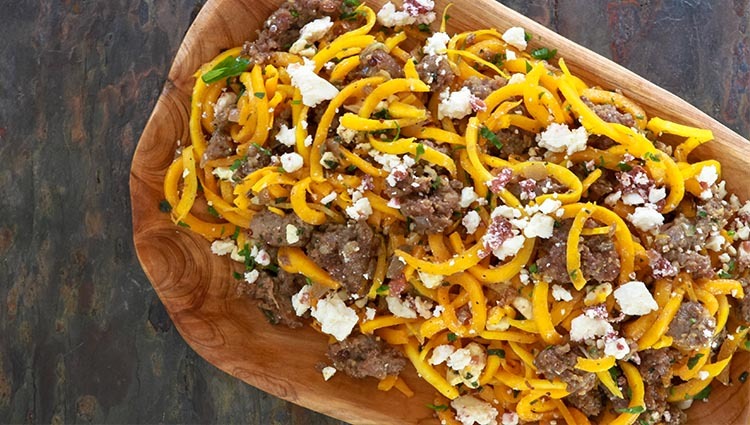 In a large bowl or serving platter, toss the cooked squash noodles, sausage, and cranberry feta in the browned butter. Sprinkle with parsley and serve immediately.